Although the sequence of events on each side of the heart is similar, events occur asynchronously. This disparity in timing reflects differences in anatomy and working pressures between left and right sides of the heart. RA systole precedes LA systole; however, RV contraction starts after LV contraction. In spite of contracting later, the RV starts to eject blood before the LV because pulmonary artery pressure is lower than aortic pressure. Differences of timing also occur in the closure of the heart valves. These differences in valve timing lead to 'splitting' of the heart sounds. (52) corresponds to closure of the SL valves and is heard at the beginning of diastole. During inspiration the aortic valve closes before the pulmonary valve due to increased venous return which delays RV ejection. During expiration aortic and pulmonary valve closure is simultaneous, and S2 appears to be a single sound. S2 is louder when the diastolic pressure is elevated in the aorta or pulmonary artery. (53) to be heard in mid-diastole. This is due to rapid filling of a dilated non compliant ventricle following the opening of the AV valves. In conditions where stronger atrial contraction develops to help ventricular filling, a fourth heart sound (S4) may occur immediately before S1 (systole). This is thought to be due to ventricular wall vibration in response to forceful atrial filling. When the cardiac valves undergo pathological changes abnormal sounds called murmurs can sometimes be heard. Under normal conditions blood flow is not turbulent but remains laminar up to a critical velocity. When blood flows across a narrowed valve, flow velocities are higher and turbulent, giving rise to a murmur. In the case of a 'leaking' or incompetent valve, turbulent regurgitant flow is produced which also creates a murmur. The most common murmurs occur due to faults in the mitral and aortic valves. The valve involved and the type of lesion (stenotic or regurgitant) can be identified by the timing of the murmur and the site on the chest wall where it is loudest. In normal individuals without cardiac disease (especially children) soft physiological systolic murmurs can often be heard. 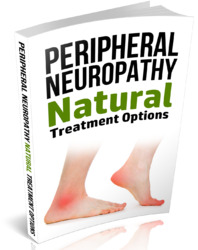 CVP is usually monitored in the large veins feeding the superior vena cava, i.e. 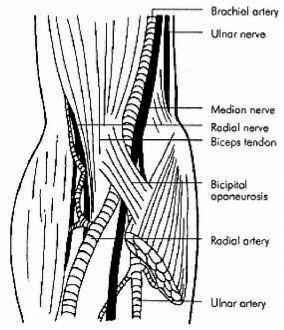 the internal jugular or subclavian veins. The CVP waveform reflects right atrial pressure and, therefore, consists of 'a', 'c' and V waves that correspond to atrial contraction, isovolumetric contraction and opening of the tricuspid valve, as described above. 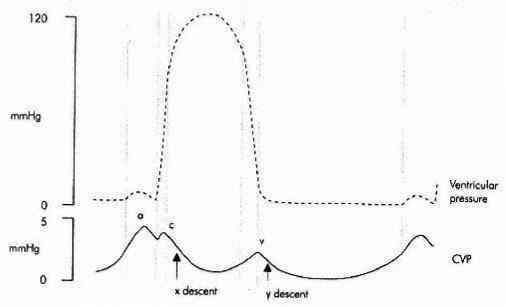 There are also two labelled downward deflections, the 'x' and 'y' descents, which occur after the 'c' and 'v' waves respectively (Figure HE.16). The 'x' descent reflects the fall in right ventricular pressure when the pulmonary valve opens. The 'y' descent corresponds to the initial drop in atrial pressure caused by rapid ventricular filling when the AV valves open. Various pathological conditions affect mean CVP or alter the CVP waveform. For example, if the timing of atrial and ventricular contraction become dissociated (as in 3° block) the right atrium contracts against a closed tricuspid valve and produces prominent or cannon 'a' waves (Figure HE.17). The mechanical performance of the heart as a pump can be summarized using a ventricular pressure-volume (PV) loop. An example for the left ventricle is shown in Figure HE.18. The cycle starts at the end diastolic point (EDP). Isovolumetric contraction follows, represented by a vertical ascending segment which ends with the opening of the aortic valve. The ejection phase segment passes across the top of the loop from right to left. Ejection ends at the end systolic point (ESP) when the aortic valve closes. Isovolumetric relaxation follows next as a vertical descending segment ending when the mitral valve opens. The final lower segment corresponds to ventricular filling and ends when the MV closes at EDP. The PV loop can be used to derive several parameters reflecting ventricular function including SV, stroke work (SW), end diastolic volume (EDV) and end systolic volume (ESV). 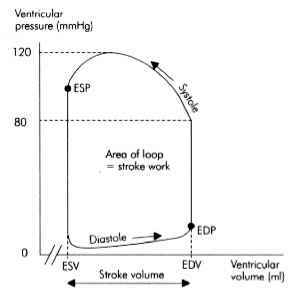 On the ventricular pressure PV loop, the EDP records volume and pressure at the end of diastole. If different PV loops are plotted for a given ventricle, different EDP are obtained (D1, D2, and D3; Figure HE.19). These points form a PV relationship for the ventricle at end diastole when plotted. This is called the end diastolic PV relationship (EDPVR). EDPVR is a useful indicator of diastolic function, and in particular ventricular filling performance, since its gradient is equal to the elastance or (compliance-1), of the ventricle during filling. The steeper this gradient, the lower the compliance of the ventricle during filling. Over the normal range of ventricular filling volumes the EDPVR gradient is approximately linear and the ventricle is relatively compliant. As EDV increases and the ventricle becomes more distended at the end of diastole, the EDPVR gradient becomes steeper showing a marked decrease in ventricular compliance to filling. Pathological conditions such as ischaemic heart disease and ventricular hypertrophy can shift the EDPVR up and to the left, demonstrating ventricular diastolic dysfunction (Figure HE.20). The ESP from several ventricular PV loops (S1, S2, S3) may be plotted to give an end systolic PV curve (Figure HE.21). 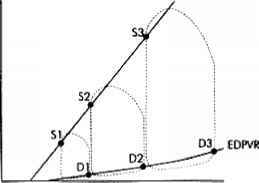 This curve is the ESPVR. The gradient of the ESPVR curve represents the elastance of the contracted ventricle at the end of systole. This is partially dependent on how forcefully the ventricle contracts, and, hence, is related to ventricular contractility. The ESPVR curve is approximately linear under normal conditions. Increased non linearity is introduced under ischaemic or hypercontractile conditions and appears as a change in gradient and shift in the curve up or down. Is ther adiffrence in cadiac out put of the right and left ventricle?